Learn from accomplished professors and educators in a very personalized program. Focus on the aspects of the music business that interest you most, such as performance, history, theory, music technology and recording, jazz studies, expressive arts therapy and arts management. You’ll find numerous performance opportunities in credit-bearing musical organizations and in private studio instruction open to all qualified students regardless of major. 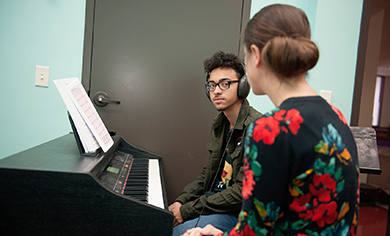 Develop comprehensive musicianship through a combination of two years of music theory, three semesters of music history, one year of piano proficiency and a minimum of two years of applied studio instruction and ensemble performance. Develop your talent in private or group lessons; at Oswego, these are available on all instruments and voice, taught by talented faculty. Apply to join one of two large choirs, or select vocal ensemble, orchestra, wind ensemble or jazz bands. Gain musical theatre and operatic experiences through our collaborations with the theatre department. Excel, and you may be eligible to join Mu Beta Psi, a national honorary music fraternity, or Pi Kappa Lambda, a national music honor society. The recently renovated Tyler Hall, the music department’s home base, contains a large theatre, two sizable rehearsal/performance rooms, many practice rooms, a state-of-the-art digital piano lab, a fully equipped multi-station computer MIDI lab, a music learning center and a digital multi-track based recording studio. After a $22.2 million renovation, Tyler Hall boasts a two-story instrumental rehearsal hall, a choral rehearsal room featuring rolling hideaway shelves for sheet music, both with superior acoustics. State-of-the-art equipment graces the new recording studios for live audio and for digital recording. Appraise live and recorded musical performances as active and discerning listeners through critical listening skills. The music department is tight knit. They all do whatever they can to help bring your success. There are many opportunities to succeed and staff that is willing to help you reach success. I think everyone in the music department knows everyone so it's easy to make connections. Everyone wants you to be successful in whatever part of music you choose to go into. I've found a happy little family here. It's full of incredibly talented professors whose main goal is to help the students succeed. If you’re willing to put in the work, the faculty will do anything for you. 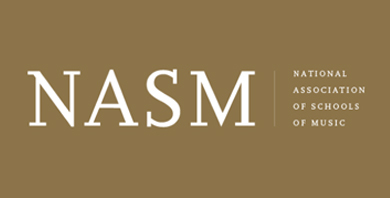 Our program is one of approximately 651 accredited institutional members of the National Associations of Schools of Music. Through the Music Department you can join Pi Kappa Lambda, a national music honor society, or Mu Beta Psi, a national honorary musical fraternity open to men and women and encourages fellowship among musicians. These updated rooms are available for music students to hone their talents on their own time or with faculty lessons.